April 11 marks the birthday of Clara Ford, nicknamed “The Believer.” As the wife of Henry Ford and mother of Edsel Ford, she certainly lived up to that title, offering support at critical junctures and in trying times. But Clara’s individual passions and contributions helped to create her own lasting legacy. Clara Bryant’s childhood shared many of the qualities of her future husband: both grew up on farmland north of Detroit in the mid-nineteenth century. Clara, born three years after Henry on April 11, 1866, was the third of 10 children and attended school until age 17. 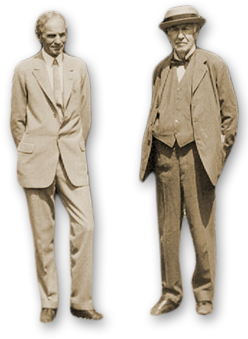 Henry Ford always appreciated her unfailing support of his ideas and ambition. As Ford found success and became internationally known, Clara traveled with him. When at home, the couple entertained at Fair Lane, their estate on the Rouge River in Dearborn, Michigan. Throughout her life, Clara supported wide-ranging philanthropic causes generously, particularly those related to health care and education. She offered trusted advice to her husband and son on matters related to business. Clara was also passionate about gardens and horticulture– her famed passion for roses led to the creation of a rose garden of more than 10,000 plants at Fair Lane! Her interest in horticulture led her to serve as president of the National Women’s Farm and Garden association, and to develop a model roadside farmstand which women in rural areas could build and use to earn extra income. Henry and Clara had one son, Edsel, who helped manage the Ford Motor Company until his death from cancer in 1943, at age 49. Clara died three years after her husband, in 1950. Remember Clara Ford next time you visit the rose garden created in her honor here at the Ford winter estate!